Before your building permit will be approved, you need your drawings signed off by someone qualified with a BCIN - did you know that Gravenhurst Plumbing, Heating & Electric can help you with that? Click image for our Comfort Maintenance Plans. Thousands of Muskoka homes heating & cooling systems are protected by our Comfort Maintenance Plans. Protect your home today. Want to Save on Utilities All Year Long? Install a Heat Recovery Ventilator! 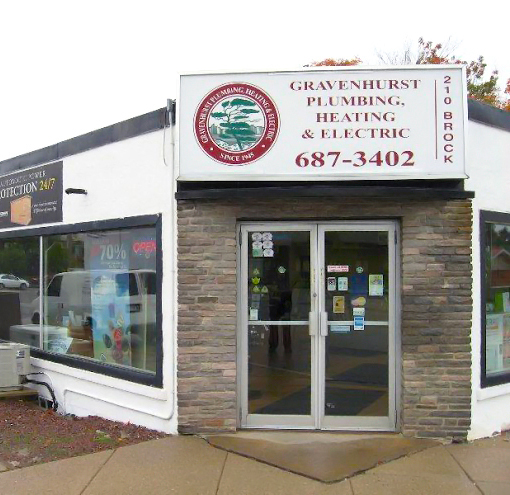 With over 70 years in business, Gravenhurst Plumbing, Heating & Electric is Muskoka’s premier mechanical and electrical contractors as well as equipment suppliers. We strive to always exceed our customers' expectations by analyzing their individual needs and desires, recommending the best equipment for efficiency and comfort, and providing prompt and courteous service. We back up our mission with fully licensed and bonded technicians that are available for Saturday and evening appointments, as well as a 24-hour emergency service. We not only provide free estimates, but our work is fully guaranteed and we can help you arrange financing. Gravenhurst Plumbing, Heating & Electric was also the first firm in Ontario to qualify under the Global Quality GeoExchange Program - the world’s most stringent quality assurance program for geothermal heating and cooling systems. We believe installing a geothermal heating and cooling system is one of the smartest moves a homeowner can make and invite you to learn more by visiting our Geothermal Heating page. We pride ourselves on having some of the friendliest and most knowledgeable staff you will find anywhere. We are more than happy to help you with whatever project you might be considering for your home. Our experts are always easy to reach by phone or email, and during our business hours someone is available to chat live with you through our website. Browse our site to see what services we offer and in what areas we are knowledgeable about. Ask a question or let us help your with financing for your next project. Also swing by our testimonials page to see what our valued customers have to say.